VERSION DOBLADA AL ESPAÑOL! Click acá! 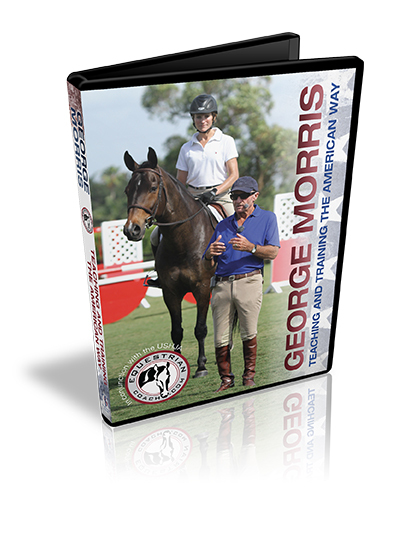 Acclaimed rider, coach, and clinician Bernie Traurig presents six DVDs explaining the history and building blocks of the American Hunter/Jumper Forward Riding System, a system endorsed and taught by George Morris and advocated by the USHJA Trainer Certification Program. 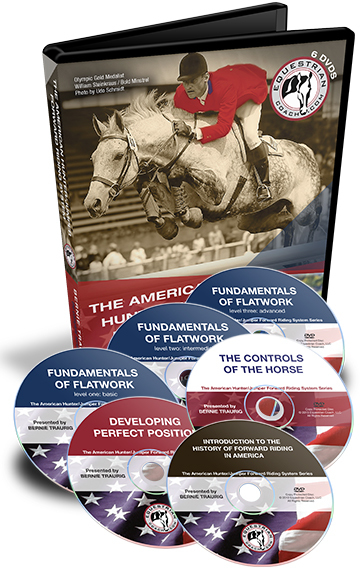 In Developing Perfect Position; Fundamentals of Flatwork; and The Controls of the Horse, Bernie shares step-by-step exercises, on the flat and over fences, that are proven to bring success. All the videos in this collection are also available to view online to Monthly and Annual members of the site or by Pay-Per-View. For our subscription options, please click here. For a complete overview of the system, including a must see video clip of the Italian Cavalry, click here. VERSION DOBLADA AL ESPAÑOL! Click acá! Acclaimed rider, coach, and clinician Bernie Traurig presents a progressive system in three levels to help you achieve your training goals in all jumping disciplines. 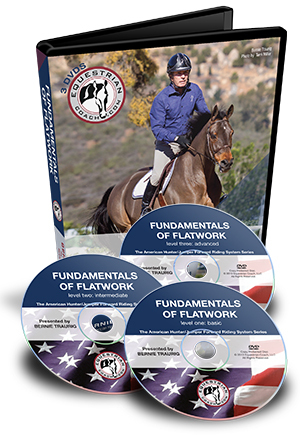 In these three DVDs, Bernie presents a simple method of flatwork that actively incorporates work over fences. The methods presented are easily understood by the average rider and yet sophisticated enough to challenge the more advanced student while imparting the keys to performance and rideability. All the videos in this DVD are also available to view online to Monthly and Annual Members of the site or for sale on a Pay-Per-View Basis. For our subscription options, please click here. This items on this DVD are also part of The American Hunter Jumper Forward Riding System Collection above. Acclaimed rider, coach, and clinician Bernie Traurig presents a building-block approach to a great position based on the American Hunter/Jumper Forward Riding System, a system endorsed and taught by George Morris and advocated by the USHJA Trainer Certification Program. 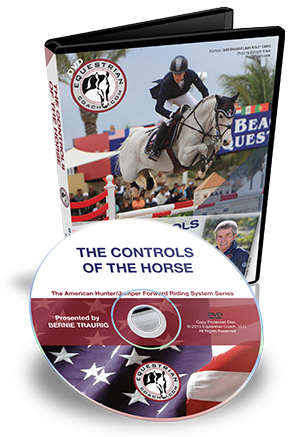 In this DVD, Bernie shares a stepby- step series of classical exercises that create balance in rider and horse, and a “lock tight” secure riding position on the flat and over fences. Acclaimed rider, coach, and clinician Bernie Traurig presents a “modern approach” to the rein and leg aids based on the American Hunter/Jumper Forward Riding System, a system endorsed and taught by George Morris and advocated by the USHJA Trainer Certification Program. In this DVD, Bernie demonstrates in a clear and simple language for both horse and rider the individual application and effect of each rein and leg aid, and how they work in harmony. Spend an hour with George Morris and demonstration riders Cynthia Hankins and Darragh Kenny as they illustrate the most fundamental aspects of the American Hunter/Jumper Forward Riding System, a system endorsed and taught by George and advocated by the USHJA Trainer Certification Program. George addresses everything from basic position to the rider’s release. This video is also available to view online to Monthly and Annual members of the site or by Pay-Per-View. For our subscription options, please click here. 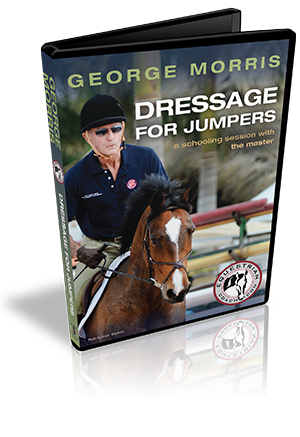 Join George Morris, former Chef d’Equipe of the US Equestrian Team, as he demonstrates his favorite dressage exercises as they apply to the jumping sport. In this schooling session, George uses his system of training on the flat and over fences to produce a relaxed, supple and attentive equine partner. Includes a bonus video: Roots of Forward Riding in America where George introduces the American style of riding and its evolution. This video is also available to view online to Monthly and Annual members of the site or on a Pay-Per-View Basis. For our subscription options, please click here. 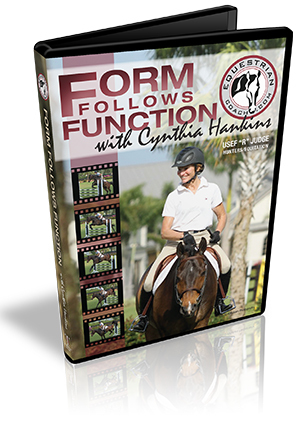 First on the flat and then over fences, Cynthia Hankins discloses the common position faults she encounters and presents the correct, classical form of the American Hunter/Jumper Forward Riding System, endorsed and taught by George Morris and advocated by the USHJA Trainer Certification Program. These videos are also available to view online to Monthly and Annual members of the site or by Pay Per View. For our subscription options, please click here. The Pacific Coast Horse Shows Association, USHJA and USEF are pleased to announce Get Connected, an educational DVD featuring USEF Tests 1-19, with Debbie McDonald (World Cup Champion and U.S. Olympian in Dressage), Cynthia Hankins (USEF "R" Judge and USEF Medal Final winner) and Michael Moran (USEF Judge and most recognized horse show announcer). This video is not available to view online.